There are seven Canadian teams in the National Hockey League and in 2014 stamps were issued with each team's logo on the Zamboni and centre ice. The NHL requires two machines to resurface the ice between periods. The ice is resurfaced before the game, after warm-ups, between periods, during playoffs, and when the game is over. With two resurfacing machines, it takes three minutes to complete the rink, each making four full passes up the ice. With one, it takes between six and seven minutes with eight full passes up the length of the ice. Before the machine was invented, it used to take over an hour with several men using scrapers, towels, hoses, and squeegees. Great choice of word for Z, what a fun stamp. ...ionic names can become generic. So original stamp and word, yes! Interesting. I like the idea of each hockey team receiving recognition like this. 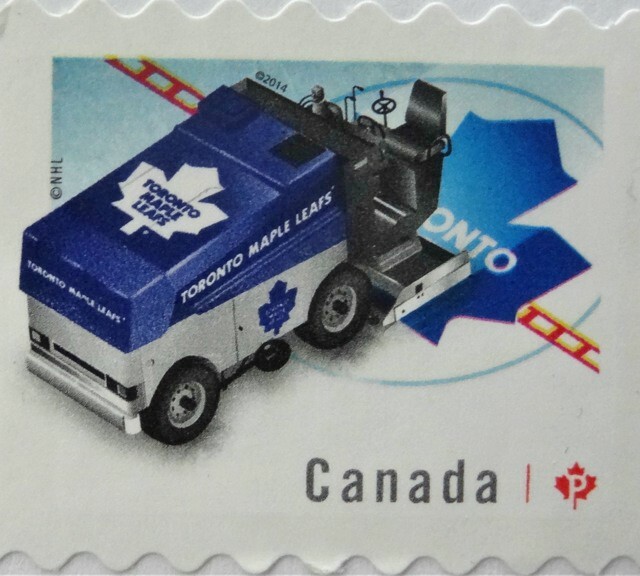 I was totally confused when I saw the Zamboni - a great stamp for an ice hockey icon. Now I’m wondering if they come on the ice to an organ fanfare. Neat little machine. Oh funny - I'm watching olympic ice skating right now.